A world traveler I'm not, but I've set foot in a number of fascinating, fun places over the years. Travel, whether across an ocean or across the street, can broaden your perspective and enrich your soul. The pleasure starts with the anticipation of the journey, followed by the excitement of the trip itself and the remembrances that reverberate for a lifetime. Below are brief stories about my excursions. This town sometimes gets a bad rap. 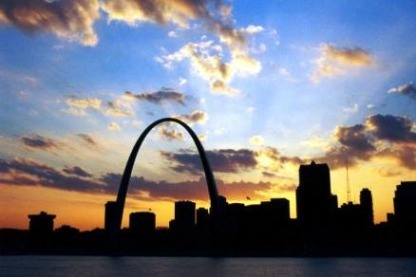 It's been alleged that St. Louis, host of the 1904 World's Fair and long ago one of America's foremost cities, somehow lost its way and languished over the decades. Don't believe it. St. Louis is super cool if you ask me, serving up an inspiring dose of culture and excitement. On a family trip to the Gateway City, we packed a load of fun into a three-day stay. Aside from attending a beautiful wedding ceremony in a quaint old church in Soulard (a revitalized red-brick neighborhood just south of downtown), we enjoyed a few hours at the exceptional St. Louis Zoo and rode a tiny pod-like elevator to the observation room at the top of the soaring Gateway Arch. When I had a few hours to myself, I visited a couple terrific bookstores, Subterranean Books and Left Bank Books, and even stopped off at Killer Vintage, a superb little guitar shop, one of the best I've seen. Consider me a big fan of St. Louis. I hope to return very soon. Paris is legendary for countless reasons. The museums, the food, the architecture, the culture steeped in musical, literary and artistic achievement. One of the most delightful moments my wife and I experienced during our adventure in the City of Light was strolling onto the pedestrian bridge Pont des Arts (right) as the scene buzzed with a gathering of revelers at sunset. The mountains, deserts and wide-open spaces of New Mexico create a sense of tranquility that is unique and most certainly divine. No wonder the landscape has been a favorite destination of artists, writers and others seeking potent inspiration. Photographer Ansel Adams was drawn to this powerful place as was painter Georgia O’Keeffe, who tapped into the region's breathtaking vistas and stark beauty to create some of her most memorable works. Several years ago, my wife and I treated ourselves to a weeklong vacation at the Bishop’s Lodge outside Santa Fe. We traversed the byways of this so-called “Land of Enchantment,” motoring from Albuquerque to Taos to Las Vegas, N.M. (the antithesis of the other Las Vegas) and lots of spectacular places in between. It should be said that I probably had more fun than my wife, who was a few months pregnant and suffering some associated discomfort. But she was a good sport and even went along with my plan to explore the pueblo ruins and underground kivas at Pecos National Historic Park, site of a Native American settlement established in the 14th century. This amazing woman with child also joined me on a long uphill hike near our resort. What an unforgettable time we had. My experience in New Mexico proves how truly transcendent a vacation can be. We were comfortably installed at the oceanfront Hilton on Singer Island. It was just 9 p.m. and my wife and kids had drifted off to sleep. Guitar Dad sensed the opportunity for some quality alone time so headed down to the beachfront bar. It was a quiet evening, just a few souls still lingering. The bar was already closed and I took a seat in a dark spot on the deck, with a wide view of the ocean, sky and surrounding resorts and condos. Bob Marley sang ruefully from the outdoor speakers, "I don't want to wait in vain for your love." Stars twinkled in the heavens as the lights from distant boats and cruise ships flickered on the horizon. An occasional jet descended along the coastline in preparation for landing at Palm Beach International Airport. For an hour and a half, absolute relaxation took over. Our long weekend on Singer Island turned out to be memorable for lots of reasons. The kids got their first chance to really swim in the ocean (under dad's attentive supervision). We took walks on the beach, built sand castles, skipped seashells along the water's edge. When a steady drizzle began to fall, we drove by the mammoth residential compounds of Palm Beach and tooled down tony Worth Avenue (looking a bit out of place in our minivan). We ate well, discovering a wealth of delightful dining at The Gardens Mall in nearby Palm Beach Gardens. I'm not much of a mall guy, but that place is awesome I must say. After two nights away, we returned home sandy, salty and sunburned. But everyone seemed refreshed. Gotta love vacations, even if they're short and sweet. Every time I visit Louisville, Kentucky, I wind up liking the place more. It's an unlikely yet agreeable blend of small town/big city, southern/midwestern, traditional/progressive. My family spent four nights there not long ago, primarily to celebrate the 98th birthday of my wife's grandmother, who has lived most of her days in Louisville. It was a great opportunity to share stories and laughs not only with her but with other relatives in town. No place even comes close to this town for extravagance and crassness. Once known for its cheap eats and affordable accommodations, Las Vegas is now a luxury destination of the highest order, defined by pricey restaurants and posh nightclubs, over-the-top resorts and Orlando-ish attractions. On a recent trip, I managed to soak up a bit of Sin City's irresistable atmosphere. I indulged in a couple of top-shelf meals, downed a few overpriced cocktails, lost $60 at Blackjack in the blink of an eye and strolled seemingly endless portions of the Strip (blindingly bright even at night). I also ventured north a few miles to take in historic Fremont Street, the city's original main drag. The last time I'd traveled to this wacky desert metropolis was in 1991. It's unbelievable how Las Vegas has changed and just keeps changing. Everything must always be bigger, brighter, bolder. I love it and hate it. I guess I mostly love it. Mixing Mainstream and Offbeat L.A. Working as a corporate speechwriter, I once traveled to Anaheim to support an executive making a presentation at Disneyland. I had been to Los Angeles a few times before, but this was my first exposure to Walt’s original theme park. My most striking discovery at Disneyland was that its castle is remarkably minuscule compared to the one we have at the Magic Kingdom in Orlando. What I enjoyed most about the trip were my little detours. After the speech was done, I hopped in my rental car and headed into downtown L.A. and Hollywood, very slowly I might add. Everybody in Orlando likes to complain about traffic, but no place suffers gridlock like poor Los Angeles. Eventually I landed at my intended destination, the famed Chateau Marmont on Sunset Boulevard, a hotel my wife and I stayed at several years before. I drove up the almost-hidden driveway into the building’s parking garage, then it was up the steps to the outdoor courtyard for a cold Heineken. The Marmont, by the way, is probably the hotel most steeped in Hollywood lore, the place where actors, writers and rock stars have come for decades to carouse in anonymity, and sometimes go so far as kick the bucket (John Belushi). After my $10 beer and a few glances at faces who looked famous (not sure), I ventured into a super-seedy section of east Hollywood in search of Charles Bukowski’s old apartment. I found it quickly, parked my car and paced the grounds for a few minutes to soak up the atmosphere. These squalid quarters were the poet’s home back in the 1960s and early 70s, when he produced some of his most celebrated low-life writings. The next morning, on my way from Anaheim to LAX, I decided to exit off the freeway into the Watts district to visit the area's famous folk-art masterpiece. It was very early (barely light) and I figured that meant the notoriously dangerous neighborhood would be quiet. And it was. 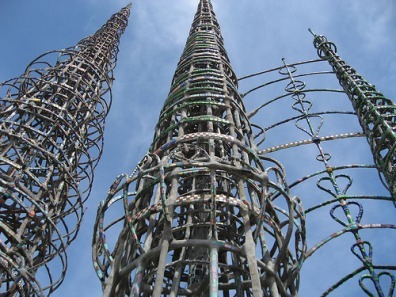 I drove up to the Watts Towers (pictured above) and didn’t see another soul. Just me and those imposing, almost sinister structures created by Simon Rodia between 1921 and 1954. The air was cool and peaceful, and the moment was completely inspiring. From the sanitized playland of Mickey Mouse to the artistic, if somewhat perilous, underbelly of Watts. Now that was fun. From the windows of the train, we watch the rolling hills of southeast England glide past. Green and gray are the colors of everything out here. But the sight is almost unreal. We've traveled across the Atlantic to see this for ourselves, and the actual landscape still looks like something from a magazine. Maybe that's the effect of gazing from a speeding rail car. Or maybe it's the Belgian beer I'm sampling. We've left behind the majesty of London, its timeworn beauty reverberating in our minds. Now we're on to Paris, a city whose romance can inspire souls thousands of miles away. The Eurostar slows as we approach the English Channel. For 20 minutes we stare at the utter blackness of the inside of the "Chunnel," the underground tube connecting England and France, pondering the fact that we're in a train, under a massive body of water, and living in a world where terrorism is reaching full bloom. The Chunnel is not a place you want to be for long. Once in France, the train accelerates sharply. Apparently the French aren't overly concerned with maintaining safe speeds, as we'll confirm on the busy Paris streets. The rolling countryside here is tranquil and comforting, at least what we see of it whizzing by. As the Eurostar nears the city, we watch the roads fill up. All traffic seems to be moving eagerly toward the City of Light. We'll enjoy four days in Paris. It's a destination of a lifetime, and we'll surely remember our adventures there forever. But the journeys along the way leave impressions just as deep. Manhattan feels like the center of the universe, its streets and sidewalks pulsating, its skyscrapers towering, its essence oozing with worldly style and sophistication. While the entire city is a place of immense wonder for me, in my opinion the best of New York dwells beneath 14th Street, in Greenwich Village and southward. One of my favorite stops is the Village Vanguard at 178 Seventh Avenue South, a jazz club rich not only in hipper-than-thou ambience but in authentic musical history. More than 100 albums have been recorded in this compact and dimly lit underground venue, including seminal releases by the likes of Sonny Rollins, Bill Evans, John Coltrane and many others. 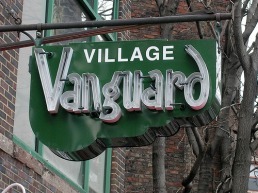 Opened in 1935, the Village Vanguard stands as a beacon for the world of live and improvisational jazz, a singular setting that bridges the past, present and future of this all-American musical genre. A three-night retreat to Man-O-War Cay in the Abacos proved therapeutic on many levels. Beyond the enjoyment of relaxing in a newly constructed home overlooking the Sea of Abaco on one side and the island's "American Harbor" on the other, I got to spend a good stretch of time with my big brother. We ate and drank well, toured Hope Town on bicycles, did a bit of boating as you might imagine, and walked (and cruised by golf cart) the peaceful village of Man-O-War. Is there anything more pleasing than the amazingly blue waters and warm breezes of the Bahamas? My family recently returned from an all-too-brief overnight trip to St. Augustine, that charming if slightly down-at-the-heels relic south of Jacksonville. We had a wonderful time of it, traipsing around the 300-year-old fort, grabbing lunch at the Milltop Tavern on touristy St. George Street, and setting up camp at a Hampton Inn on nearby Vilano Beach. It turned out to be a spectacular afternoon for splashing around in the surf, and the kids couldn't get enough of the sun and sand. After enjoying the ultra-hip excitement of Seattle for a few days, my wife and I took a ferry to picturesque Victoria, British Columbia. Aside from a dreadful bout of sea-sickness for the both of us aboard the Victoria Clipper, our Canadian adventure was a pleasant and peaceful one. We walked the quaint downtown streets of Victoria before making a beeline to the most highly anticipated destination of our trip: the remote Point No Point resort along Vancouver Island's rugged west coast. The resort's name says it all. For a few days we just rested in and around our cabin, enjoyed cold beverages in our private hot tub overlooking the ocean, savored the superb on-site cuisine and explored the property's serene walking paths and beaches. Leading to one especially scenic spot is the brilliantly painted bridge pictured here. After wrapping up our dreamy experience at Point No Point, we ferried to the fine metropolis of Vancouver. We roller-bladed through Stanley Park, strolled a few colorful neighborhoods, dined well and took in breathtaking views of both sea and snow-capped mountains. This vacation was a special anniversary celebration – and what an amazing one it proved to be. Chicago is one of the world's great cities, a destination offering enriching experiences for all ages and interests. I've traveled there a few times over the years and can never soak up enough of the place. During my most recent trip I indulged in a perfectly prepared filet at Gibsons Steakhouse, browsed the stacks of used books at Powell's, visited the Jazz Record Mart, strolled Grant Park and boozed it a little at the subterranean Billy Goat Tavern. My most unforgettable experience took place when I jumped on a city bus along North Michigan Avenue and rode patiently to the heart of the South Side. 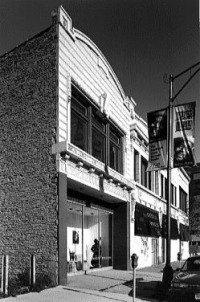 I hopped off and ambled a couple of blocks to the old Chess Records building at 2120 S. Michigan Ave., pictured on the left and now home to the Blues Heaven Foundation. I handed over the modest entry fee to take a guided tour of the old recording studio and soon learned I was the only guest for that particular session. A few of the nicest folks spent almost two hours with me, showing me the rooms where Muddy Waters, Willie Dixon, Howlin' Wolf and Chuck Berry (and later the Rolling Stones and Yardbirds) committed their musical magic to tape. It was one of the most hospitable welcomes I've ever received. They even sat me down with a bowl of popcorn to watch a short historical video about Chess. To top it off, Willie Dixon's gracious daughter greeted me, handed me her business card and wished me well. I caught the bus back to my hotel on the Miracle Mile, floating in an almost dreamlike state after spending such a blissful afternoon in blues paradise. I'd never traveled to Hawaii before the fall of 2007, when a business trip put me out there for a few days. My first stop was the Big Island, that great expanse of mountainous paradise punctuated by vast ancient lava flows. Then came Oahu and its electric metropolis Honolulu, and of course wonderful Waikiki Beach. Early one morning before a meeting, we grabbed our coffee and hiked up Diamond Head for unforgettable panoramic views of the island and the mighty Pacific. But why try to write about this region's beauty and spirit when you know full well that Mark Twain penned a passage about the islands so moving and true that it stands as their singular, defining description? What follows is his brilliant prose poem for Hawaii. "No alien land in all the world has any deep strong charm for me but that one, no other land could so longingly and so beseechingly haunt me, sleeping and waking, through half a lifetime, as that one has done. Other things leave me, but it abides; other things change, but it remains the same. For me its balmy airs are always blowing, its summer seas flashing in the sun; the pulsing of its surfbeat is in my ear; I can see its garlanded crags, its leaping cascades, its plumy palms drowsing by the shore, its remote summits floating like islands above the cloud wrack; I can feel the spirit of its woodland solitudes, I can hear the plash of its brooks; in my nostrils still lives the breath of flowers that perished twenty years ago." Want to see some nicely produced short videos about Hawaii? Visit this section of the islands' official tourism site, Go Hawaii. On an excursion my wife and I made to Key West, we indulged in the customary pleasures of this celebrated sliver of land just 90 miles north of Cuba. Drinking, booze cruising at sunset, jet-skiing, bar hopping along Duval Street. Did I mention drinking? We stayed at a delightful bed and breakfast in a relatively calm part of the business district. It was a nice, romantic getaway. Naturally a highlight of the adventure was touring the Hemingway Home & Museum on Whitehead Street (pictured to the left). It was here that the author made his home from 1931 to 1939, penning A Farewell to Arms, The Snows of Kilimanjaro and other classic novels and short stories. We walked from room to room in the two-story house, which showcases Hemingway's actual furniture, artwork, books, hunting artifacts and other trinkets. Our tour guide led us into the little upstairs room over the pool house, where the writer banged out his masterpieces at a typewriter atop a small desk. We also strolled the lavishly landscaped grounds and purchased a few keepsakes from the gift shop. Driving from Orlando on this trip, we twice took in the spectacular views from the Seven Mile Bridge, which connects the middle and lower keys. Before heading home, we stopped off in South Beach for a couple days of lounging and loafing. It was an unforgettable vacation spent with the woman of my dreams. “Never go on trips with anyone you do not love,” Hemingway once cautioned, and I couldn’t agree more. When I attended a conference in Memphis, Tennessee, a while back, I did everything I could to minimize my time in sessions and instead explore this monumental music town solo. Yeah, I walked through Graceland, which is quite a spectacle in its groovy, kitschy way and which is important simply because it was the House of Elvis. But I dug deeper, touring Sun Studio, where Mr. Presley, Howlin' Wolf, B.B. King and a host of other sonic pioneers made recordings that shaped the future of rock, blues and country. I taxied across town to Ardent Studios, where I managed to slip in an open door and walk the hallowed hallways and peek inside a few rooms. It was here that Big Star and Led Zeppelin recorded in the early 1970s, and later where ZZ Top, Stevie Ray Vaughan, REM, The White Stripes and countless other great bands left their immortal imprint. Naturally I took up temporary residence in the venerable Peabody Hotel, a most impressive locale patronized over the decades by the town's most illustrious visitors. I even squeaked in excursions to the local Gibson Guitar Corp. factory and the Lorraine Motel, where MLK Jr. was so savagely taken down. All in all it was an enlightening and delightful adventure. Nashville usually gets all the attention in this state, but Memphis is where so much of our greatest music was conceived and where you can't help but be inspired by such a rich musical legacy. My family recently returned from Amelia Island, where we spent a relaxing Thanksgiving away from home and away from the familiar, the humdrum, the predictable. My wife, the kids and I were joined by my Mom and Dad, who agreed that getting away was a good idea and made the drive down from North Carolina. Amelia Island proved to be a terrific gathering spot for the Guitar Dad clan. This barrier island off the coast of northeast Florida is a quiet, relatively out-of-the-way destination of refined resorts, wide beaches, lots of golf and tennis, and the enchanting historic district of Fernandina Beach. We enjoyed our well-appointed oceanfront accommodations at the Amelia Island Plantation, and savored a bountiful Thanksgiving feast at the Florida House Inn, a comfortable "old Florida" B&B with a friendly staff and seriously delicious cuisine. It was wonderful to get the kids together with their doting grandparents – and great to unplug from our routine and take in the tranquil surroundings. If you've never ventured to Amelia Island, consider adding it to your travel wish list. At the risk of sounding like the local visitors bureau, I'll tell you that it would be hard not to enjoy the natural rhythm of Amelia Island, a place of serene beauty, abundant charms and extraordinary calming powers.